Pinch and a punch for the first day of the month! Today is the first day of Autumn and as usual I like to buck the trend and go with some brights. 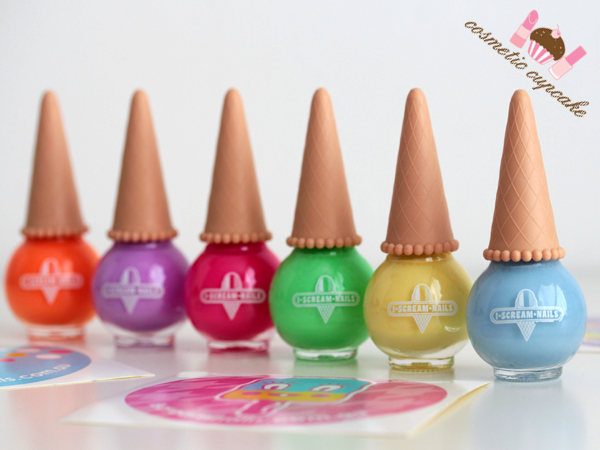 I'm excited to show you 6 bright fun shades from I Scream Nails - if you haven't heard of them they are nail artists based in Melbourne and Sydney doing awesome freehand nail art. 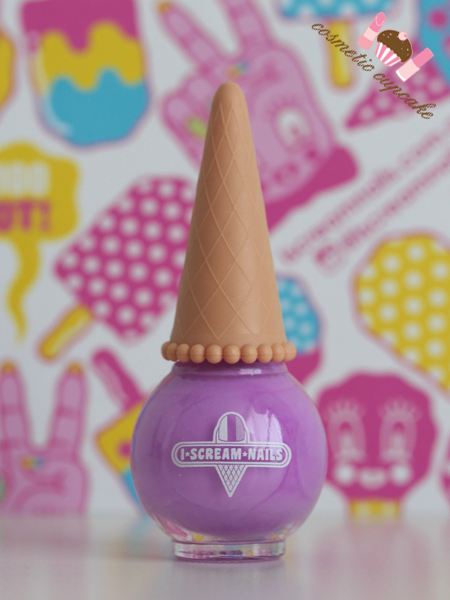 I Scream Nails released 6 ice cream polishes late last year that are 5 free meaning they don’t contain Toluene, DBP, Camphor, Formaldehyde or Formaldehyde Resin; are 100% vegan and made here right in Australia. I was so pleasantly surprised at the amazing formulas so read on for my swatches and review! Warning: this post is pic heavy. 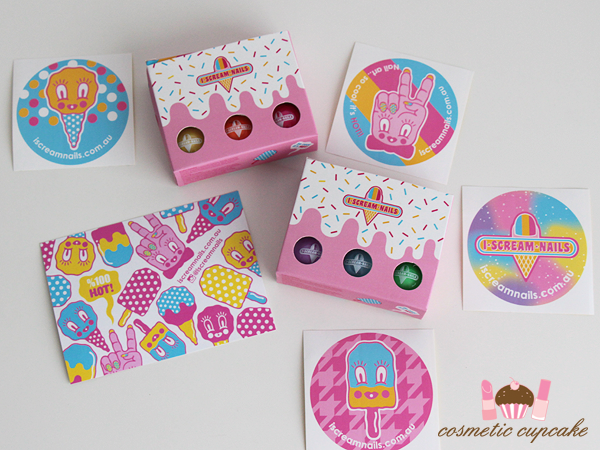 The polishes come well packaged in cute ice cream themed boxes along with I Scream Nails stickers. The shape of the bottles is very familiar as they are pretty much identical to the Etude House polishes that were released a few years back. They seem difficult to use but are really easy to hold and use. 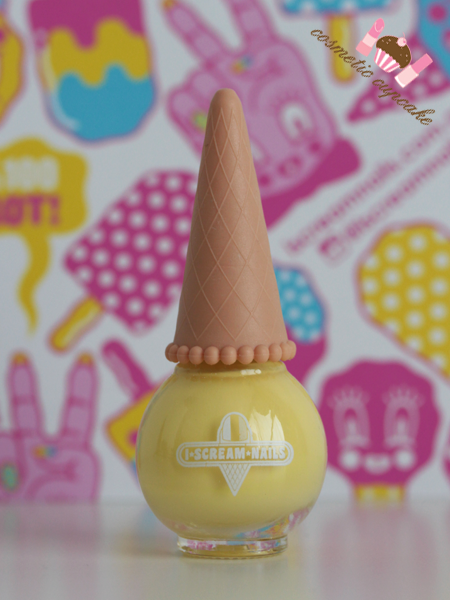 Juicy Juicy is a pastel yellow creme and reminds of me a juicy juicy lemon! I adore yellow polishes but most formulas I've come across are streaky, thin and hard to work with. The formula of Juicy Juicy is hands down absolutely SPOT ON - no dragging, no streaking and it's fully opaque in 2 easy coats. LOVE. 2 coats is pictured. Mint Madness is the odd one out in this collection by being a frosted neon mint green. The formula was the odd one out too as I found it thick and streaky and unfortunately tricky to work with. 3 coats is pictured. 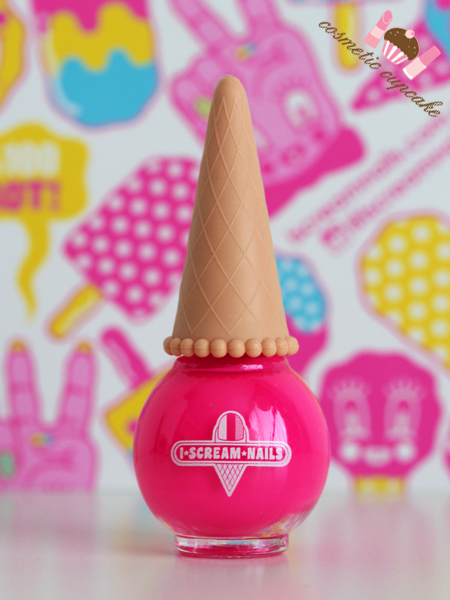 Bubblegum Bang is a bright bubblegum hot pink neon creme that's super opaque and dries to a slightly matte finish. 2 coats is pictured. Grape Soda is a pastel mauve creme with the same opaque and easy formula to work with. I'm always drawn to shades like these and it would look so cute paired with some simple white polka dots. 2 coats is pictured. Sunny Boy is named after the great Aussie ice treat that most people know from their childhood. What I would have given for one today in the yucky Sydney heat! It's a bright orange neon creme that a dries matte and my pics don't do it justice as it's a true neon and is much much brighter in person. 3 coats is pictured. 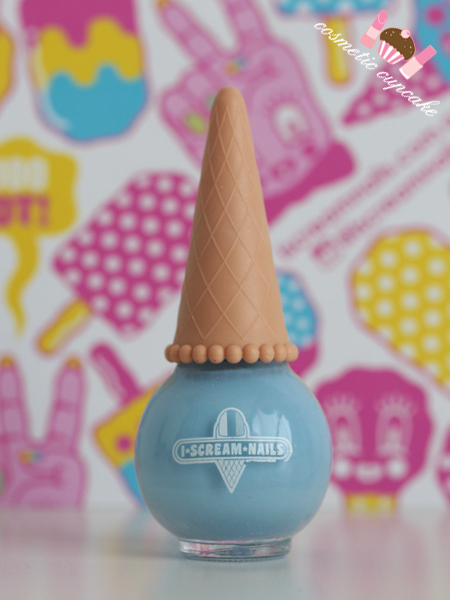 Overall: I am thoroughly impressed by the I Scream Nails polishes and I can't wait to do some proper nail art with them! The formulas are amazing and especially considering they're pastels and neons which are notorious for having tricky formulas. The formulas are opaque and easy to work with and dried quickly to a high gloss shine. The only exception was Mint Madness which was the problem child of the collection being thick and streaky - perhaps I got a dud bottle? My must haves for the collection are Blue Heaven, Grape Soda and Juicy Juicy. 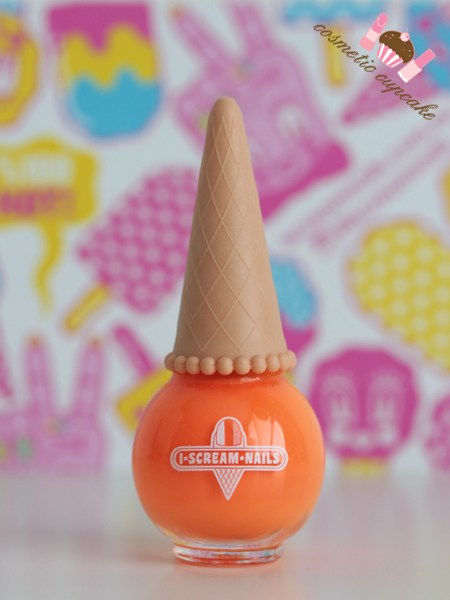 Details: The I Scream Nails polishes are available from the I Scream Nails online store and in their nail salons for $14.95 each or you can buy the entire set for $79.95. What are your favourites from the collection? Hope you're all having a fab weekend! I wish more polishes came with stickers! 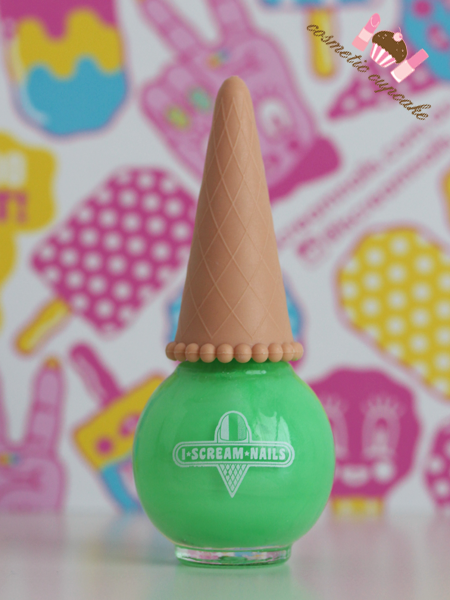 Anything ice cream shaped is adorable I think! These are adorable! I'd probably pick them up just because of the packaging. I agree! I love that they aren't only cute but are also fantastic quality. Perfect for the warmer months definitely! They are seriously impressive, you make every colour look so good on your nails! Holy Moly these are sooooo dreamy! Love them all but Grape Soda...*swoooons* You have such fab brands in Oz huny!